This Expedition is defunct. This is an archive, please do not make any further edits to this page.. Routes Expedition is a Wikitravel Expedition to promote and coordinate collaboration to provide coverage for information about major highways. If you'd like to join the effort, please add your signature to the bottom of the page! A road atlas. This will be helpful to see what lies along a highway that could easily be overlooked. A travel guide. Some, such as those issued by AAA in the US, list things to do along major highways. 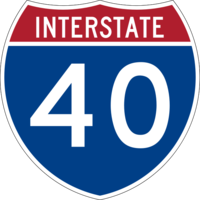 List of US Interstates Lists all major Interstate highways. Feel free to pick of these and plunge forward! Please list your name and what you think you can do best, such as which highways you might work on, if you can create logos for the route (like the Interstate 40 logo at top), if you can make maps of routes, etc. AHeneen, I can contribute to US Interstates, namely in the southeast. Epolk - I can create articles for any U.S. Interstates and am familiar with most of the Interstates in California, Arizona, and Nevada so I can expand and fact check those articles as needed. This page was last edited on 15 July 2011, at 22:54.